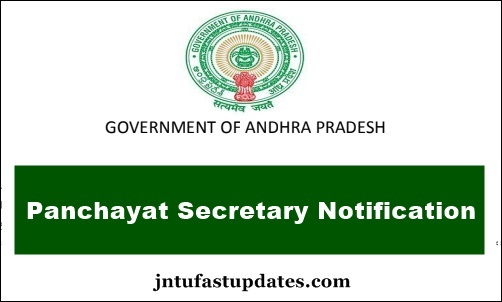 APPSC Panchayat Secretary Notification 2019, Application Form: Andhra Pradesh PSC has been released Panchayat Secretary Grade IV (Group III) Recruitment Notification 2018-19 for 1051 Vacancies. Aspirants can check the notification and apply online for group 3 Panchayat Secretary posts. Andhra Pradesh Public Service Commission (APPSC) lets the interested aspirants apply through its official portal, psc.ap.gov.in. The application process will be starting on 27th December 2018. Hence the hopefuls can get ready to apply for APPSC Group III posts. Latest news: 18-01-2019: APPSC: Last date for submission of applications for the post of Panchayat Secretary (Notification No. 13/18) is extended up to 26/01/2019 (Note: 25/01/2019 is the last date for payment of fee up to 11:59 mid night). Andhra Pradesh Public Service Commission is the state government-owned organization that monitors various recruitment processes for its affiliated organizations. It releases various job notifications and hires the suitable aspirants into various designations based on their merit. Yearly, the APPSC will announce the official notifications for Group 1, Group 2, and Group 3 posts. Aspirants waiting for AP Group 3 notification 2018 can go through the complete details from this article. For the reference of aspirants here we mentioned the brief information regarding the group 3 posts. since a long days, andhra people is waiting for government jobs notifications. Earlier AP CM Chandra babu naidu given a green signal to release the job notifications for ap police, group 1, group 2, group 3, group 4 vacancy posts. its a great opportunity for endeavors for grabbing a job in government sector which is very easy and smooth compared to private sector jobs. its good feast to all andhra people before elections. APPSC Group 3 Online Application form registrations and etc information are announced on December 21. This year the Andhra Pradesh PSC has announced 1051 Group III posts; the vacancies include, Panchayat Secretary Grade IV Posts. Hopefuls having the suitable educational qualification can apply for the announced posts online at psc.ap.gov.in. To apply for the AP Gr. III posts, applicants must have the minimum educational qualification of any Graduate Degree from any of the recognized university/board. Age limit of applicants must be between 18 to 42 years. However, age relaxation is applicable for reserved category candidates as per the norms. Selection of candidates will be done through 3 rounds, Preliminary examination, Main examination and interview rounds. Selected and recruited aspirants will get a good pay scale as per the APPSC pay band. For more info regarding the application fee, important dates, application process, APPSC Group 3 Application form check the following article. (Grade – IV) in A.P. Subordinate Service Must have passed the Degree from any University in India established or incorporated by or under a Central Act, State Act or a Provincial Act or an Institution recognized by the University Grants Commission. RESERVATIONS: There will be reservations in direct recruitment in respect of Scheduled Tribes, Scheduled Castes, Backward Classes, Physically Challenged and Women as per Rule 22 and 22 (A) of A.P. State and Subordinate Service Rules. Hopefuls need to qualify in each round to get eligibility for the next round. Finally, candidates qualifying all the rounds with good merit will be accountable to get the AP State government jobs. Selected aspirants will get a good pay scale of Rs. 16, 400 – 49, 870/- per month. How to Apply Online for APPSC Panchayat Secretary (Grade-IV) Posts 2019 Online? Also, the aspirants can find the ‘APPSC Panchayat Secretary Online application form 2018’ on the website. Online Application for Panchayat Secretary (Grade-IV) in A.P. Panchayat Raj Subordinate Service Link has been enabled. Click Here Below link. How to apply for APPSC Group 3 Posts Application Form Registration Online? Step 1: Go to the official website of APPSC — psc.ap.gov.in. Step 2: On the homepage, scroll down to the tab for One Time Profile registration (OTPR). The commission has also provided the direct link to the one-time registration page. 1.4 How to Apply Online for APPSC Panchayat Secretary (Grade-IV) Posts 2019 Online? Sir Na application lo Na degree pass out year wrong pettanu sir ,so idhi change cheyyadam avuthundha ?& Avvithe a date loogaa chesukovali cheppandi sir & ala chesukovali sir? Sir, white card undani by mistake lo yes pettanu.currection option yeppudu istaru answer me. Panchayat secretary application district wrong pettanu sir modified date inaka ivvaledu Inak eppudu istaru sir plz rpy answer sir. Panchayat secretary jobs Guntur district ki 50 padinay kada. oc category lo enni posts vunnayi cheppagalara please reply me. Sir Guntur district ki Panchayat secretary posts 48 vunnayi vatilo oc category lo enni vunnayi cheppagalara please tell me sir. Sir Guntur district ki oc category lo enni posts vunnayi cheppagalara please tell me .